Christmas around here is really low key on Christmas Day. Since the oldest three kids are out on their own with significant others and we have purposely told they to spend Christmas with the “other side of the family”. This year our Christmas with them will be next Sunday. That meant that I didn’t have to make a fancy meal. I told the two kids that were here and Hubby to come up with an idea of what to fix. Fried Chicken with special mashed potatoes was the noon meal and the evening meal was fry bread tacos. At Christmas or any other holiday there is typically a chess tournament going on. When I was young my parents taught us to play chess so that when we got together with our cousin who had cerebral palsy would always be able to have someone to play chess with. We have carried on the chess tradition and have taught our kids to play. In the past 24 hours I have played 5 games and lost one to Hubby. One game took an hour and fifteen minutes!! 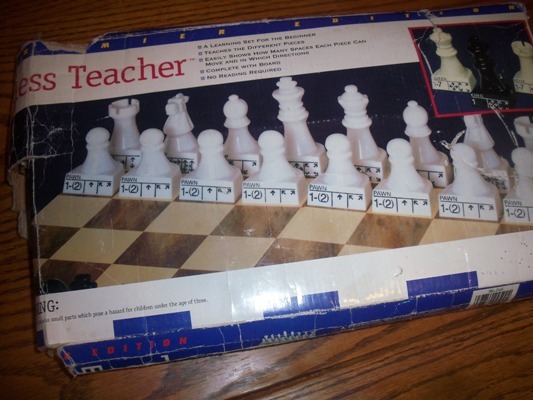 This is the chess set we have used to teach the kids, Chess Teacher . As you can see the pieces have a little diagram on the front that shows the players which direction each piece can move. I love it. All in all, it was a good day. The rest of this week is going to be CRAZY so it was a treat to have a laid back day. Merry Christmas everyone!! I hope you were able to take in some of your holiday traditions. This entry was posted in Cooking, Country Life, Family on December 25, 2012 by Jo. Merry Christmas Jo! 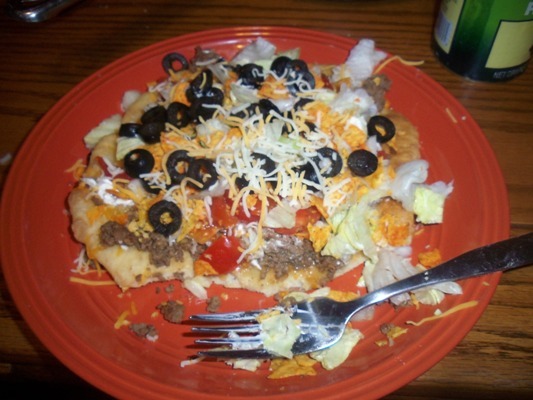 Your fry bread tacos look yummy! Would you be interested in sharing the recipe? Looks yum! Question for you: On the Easy Street bonus triangles you recommend saving, and I’m all for that, do you cut them off with scissors, or do they need to be cut with a rotary blade and ruler for more accuracy? Merry Christmas Jo! I love reading your blog. I came through quilting but enjoy hearing the family things and the farm things too. I’m a farmers daughter from South Australia, Australia. I need that chess set! I’ve got no idea how to play and the visuals would really help me and then I could teach my kids! Oh, yeah, today I fully intend to do SOMETHING quilty….it’s been too long!! Where did you get the Chess Teacher game? I have a grandson who loves Chess but we play “Karter” rules as he does not understand the “real” rules of the game yet. Your fried bread tacos look wonderful. I love reading your blog and knowing that you are from Iowa makes it extra special as I am from Iowa. Actually had a son and daughter-in-law graduate from Upper Iowa University so they lived in Fayette area and son worked at the Fareway store in Oelwein so they were pretty close to you. You can find the chess set by following the link in the post. Where is says “chess teacher”, just click on that and it will take you right to Amazon. It’s cheap…like $9. Kelli graduated from Upper Iowa in 2010….and yes, we’re about a half hour away from there! !